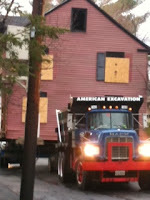 Proof Positive that Houses are Moving!!!!!! It was a dreary Tuesday. moving of the historic Lowell Mason home. Medfield, MA is the birthplace of Lowell Mason who is considered to be the "Father of American Music Education". 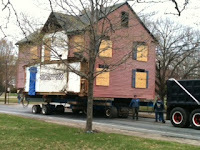 The Lowell Mason home was moved from it's site on Adams Street to a new foundation right by the "Swim Pond" on Green St. It was a busy day that Tuesday in Medfield. Not a sight that you might see often, so folks were out in droves, umbrellas in hand to watch the home being pulled by truck to it's new resting place. The town was swarming with utility trucks and workers. Detours everywhere!... It took about 11 hours to make the move. Not bad for an old house! How House Moving Works I'm Moving Houses Too! Want to sell yours or buy one? 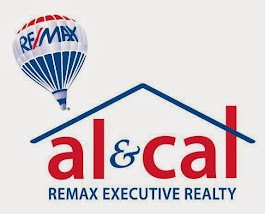 We are proud and excited to announce our affiliation with Remax Executive Realty. .
An important part of our decision was based on the fact that we have worked with the excellent agents of Remax Executive, with locations in Franklin, Medfield, Hopkinton, Holliston, Grafton, and Natick. It has a commercial division as well. and that all important 2nd opinion! I'm not talking about just the weather, the real estate market is heating up! It's time to get that property on the market! If you are looking to purchase, it's time to start looking! Foolproof Facelift! and It's Free! One of the easiest ways to give your home an inexpensive face lift is by painting. Not only does it look fresh and clean, but you can change the feeling of your home with the swipe of a brush! One of my first places, I had a great vision for the kitchen. I was going to make it "garden-like"- a pretty green base, under white lattice. What I got would have un-nerved St. Patrick himself. It was like stepping into a giant florescent shamrock﻿! If you are anything like me, you hesitate. Why? you're afraid of what your color choice will look like in your room. Coloring inside the lines made easy with this free tool! Sherman Williams Color Visualizer. I wish I had seen this last week, before Teresa and I went out in search of paint colors for her "new look". We hit a few stores including Hometown Paint in Franklin. They also had a pretty cool thing there. A display where you can view your chip under different simulated light options. and visit these web sites. Have a decorating story of your own? Or any advice? Please feel free to comment below.